It’s spring! We could talk about how it’s a time for rebirth and new beginnings yadda yadda or we could talk about food. And the fact that it’s officially grilling season. If you’ve been keeping up, you know boyfriend and I bought a house last year. We renovated the entire inside of the house, and decided to tear up the concrete in the backyard. We finally have a patio, table and grill in the back. To prep for spring, boyfriend has been babysitting his veggie sprouts like they are his children, and I’ve been planning our perennial garden and patio lighting situation. As soon as it’s warm enough in the mountains, boyfriend will go fishing and we’ll spring for a smoker. Yea, smoked fish. Anytime we want. You mad bro? For now, I’m just happy we have a place to sit and a grill that’s ready to use. And that means Joojeh (Chicken) Kabobs. 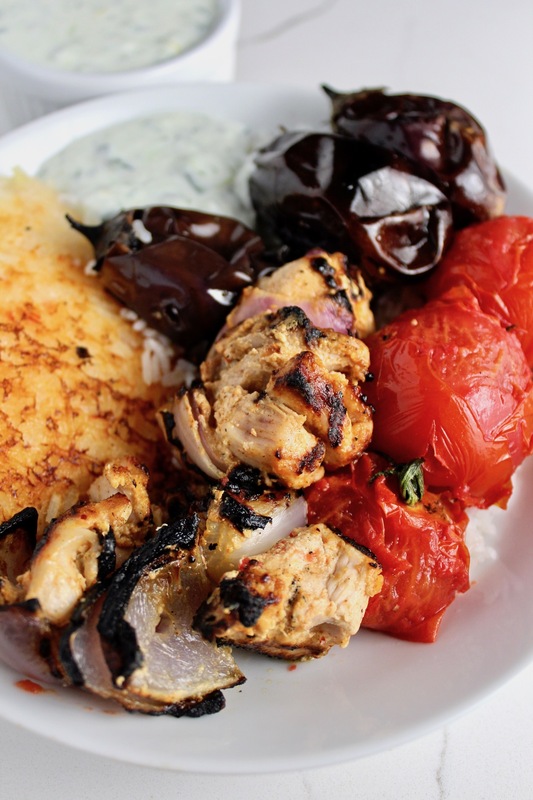 What is it about Kabobs that makes regular food taste more fun? Maybe it’s the fact that your food comes from a stick and therefore it’s like interactive? Or we just associate kabobs with backyard parties and so they are naturally festive? Whatever the case, these were fun and festive and 10/10 would make again. I didn’t love the fact that I had to handle raw chicken/finagle it onto a skewer but my discomfort was temporary. Boyfriend was grill master so once it was on the skewer I was done for the day. The marinade on these Joojeh (Chicken) Kabobs is packed with flavor and the longer you let them sit in the fridge, the better. Also, I found these little mini eggplants…what!! They were labeled Indian eggplants at my market and I couldn’t NOT get them. I skewered mini sweet peppers and tomatoes along with these. 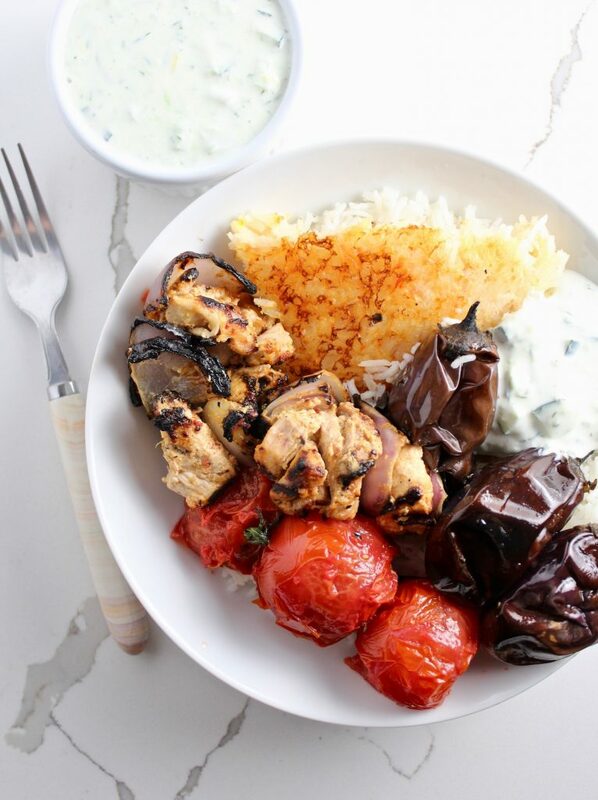 And if you can swing it…go for Tahdig (Crispy Persian Rice) with these Joojeh (Chicken) Kabobs. Top it off with some Mast-o-Khiar on the side and you’ve got a feast on your hands. *You could use chicken breasts but they might dry out on the grill, so just watch them closely. You could also likely do this in the oven if you don’t own a grill. I haven’t tried it but I’d put my oven to 425F, place the skewers on a grill pan or baking sheet and cook for about 15 minutes or until chicken is cooked. The last 5 minutes I’d turn the broiler on. Let me know if you try this! Trim the excess fat from your chicken and cut into 1-2 inch pieces. 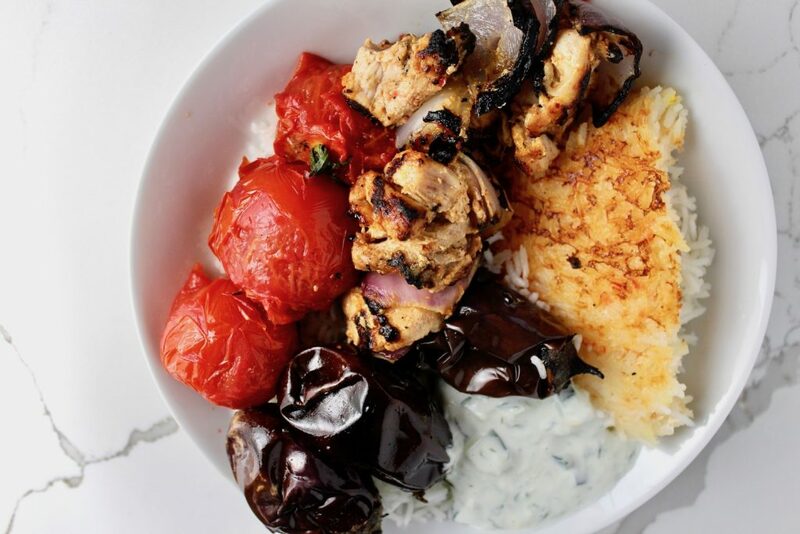 Combine greek yogurt, lemon and all the spices together in a large bowl. Mix in the chicken and let this marinate in the fridge for at least 5 hours, overnight if you can. When ready to grill, cut your onion into big chunks and prep your veggies. Make sure everything is big enough to go on a skewer, but not so big it will fall off once it gets cooked/soft. 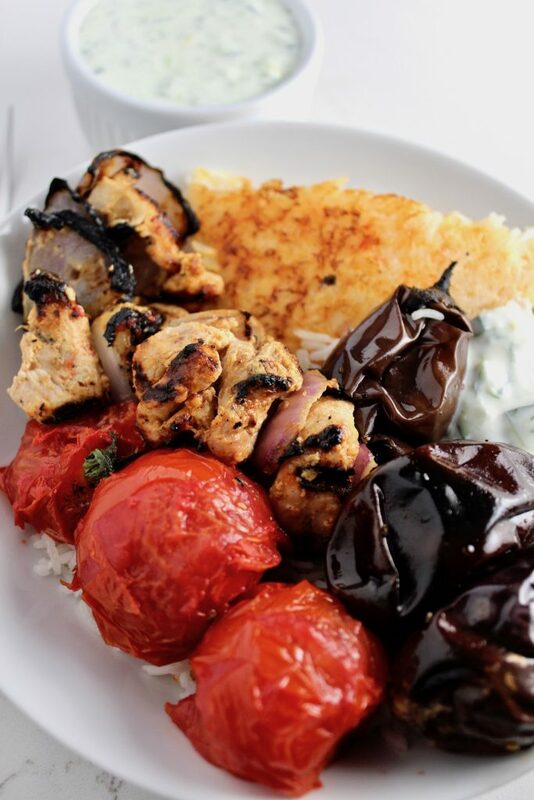 Alternate red onion and chicken pieces on 4-6 skewers. Then, add your veggies to the other skewers and brush with olive oil and salt. On medium high heat, add your chicken and eggplant skewers to the grill. These will need the most time. Turning about halfway at the 10-15 minute mark, you’ll add your other veggie skewers to the grill. You’ll cook the chicken for a total of 20-25 minutes depending on your heat. Check to make sure the chicken is done. Pull these off the grill and let them sit under aluminum foil if you’re working in batches. Serve with Tahdig and Mast-o-khiar!